I actually didn't know about this until someone on another message group mentioned it to me yesterday. Crazy. Second, what an absolutely boring screenshot to use. They should have shown some werewolves or orcs in there! Not as exciting as it is... they forgot to mention so many of the wonderful aspects . Yeah, you're probably right, he's playing as India. SotM is listed. That's funny. For me its usually getting eaten by a spider. 1. I like the publicity. 2. That is clearly FfH 1. 3. The screenshot is actually the one posted in the FfH I thread demonstrating the look of the veil cities. 4. Was it just me or did we get the title of "Best"? Bah, FfH is the best whatever they say. But... I do think they made it sound nice, even if it didn't quite do it justice. It's an awesome milestone, in any case. I dont know, but I see they also included it on the CD that came with the magazine. 1> Yeah, talk about using outdated art! 2> They placed that "The Best" tag just questionably enough so it might apply to all of the mods, or maybe to FfH. 4> And if they don't, (Cocktail made with OJ & vodka) - (pilot of an automobile) 'em! Of course FFH is the best... for me it beats the original as well. Who if not for this wonderful development team would deserve the title the best??? Yes, which is a pity. They should have chosen FFH2, and then not called it "The Best" but "Better than the original by Far"
Like everyone above has said, this is the BEST, all MODs listed were from two-three months ago (maybe longer) when they tried them out. Wether FFH1 got "the best" or not... FFH2 surely will... looking forward to seeing how they will express the superiority of FFH2 to the old one since they have already praised FFH1 with VERY BIG words. Ps. (toStrategyonly and Kael) andboth the links in the mod thread that links to this article now work (at least on my computer). To clear up some confusion, the one in the middle with "The Best!" on it (in this case FfH 1) is indeed their favourite. 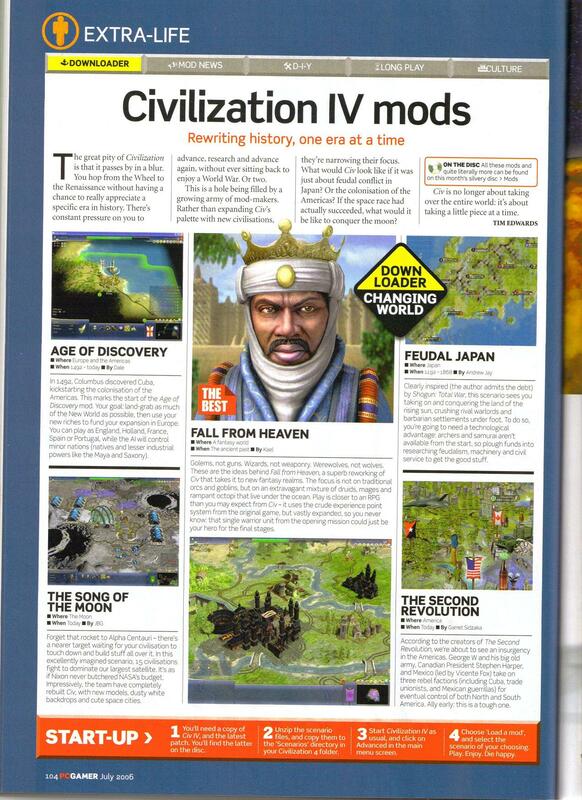 Actually, it's obviously either the best of Civ4 or SotM (for some reason), it comes right after it and, well, that's all there is to it.